16.5VAC, 20VA from UL Listed, Class 2 transformer (sold separately). Maximum charge current 0.5 amp. Low battery disconnect prevents batteries from deep discharge. System AC input VA requirement: 26.45VA. 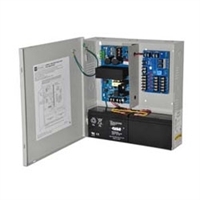 AL300ULM multi-output access control power supply/charger is specifically designed for use with access control systems and accessories. This unit converts a 115VAC / 60Hz input into five (5) individually protected Class 2 Rated power limited 12VDC or 24VDC outputs. Each output will route power to a variety of access control hardware devices including Mag Locks, Electric Strikes, Magnetic Door Holders, etc. These outputs will operate in both Fail-Safe and Fail-Secure modes. Controlled trigger input is achieved through normally open (N.O.) or normally closed (N.C.) supervised input or the polarity reversal from an FACP (Fire Alarm Control Panel). A form "C" dry output relay enables HVAC Shutdown, Elevator Recall or may be used to trigger auxiliary devices. Input 115VAC / 60Hz, 3.5 amp. Input fuse rated @ 3.5 amp/250V. Fire Alarm Panel or Access Control System trigger inputs. N.O. or N.C.supervised trigger input and polarity reversal trigger input. Five (5) PTC protected outputs, rated @ 2 amp. Output relay energizes when unit is triggered (form "C" contact rated 1 amp @ 28VDC). - Notification trigger is selectable for 30 seconds (factory set) or 6 hours. Power fail supervision relay (form "C" contacts). AC input and DC output LED indicators (power supply board). Red LEDs indicate condition of power outputs (multi-output board). Power & input trigger LEDs (multi-output board).